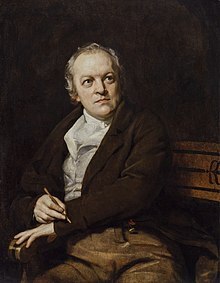 William Blake (November 28, 1757 – August 21, 1827) was an English poet, thinker, painter and printmaker. Simple: Tiger, tiger, your fur shining as bright as fire, in the forests at night: what great forever living artist could be able to describe exactly how frightening your appearance is to us? ↑ "Fearless Symmetry" by Avner Ash and Robert Gross, 2006, Princeton University Press, Princeton, New Jersey, USA. This page was last edited on 26 October 2009, at 10:29.